Heroes explore the corridors, chambers, and caverns that exist below the surface of the world. This fantasy-themed dungeoncrawl took up the mantle once held by now-OOP classic games such as Heroquest and Warhammer Quest. The huge box is chock full of plastic monsters and fun dungeon-delving adventuring. The game spawned five expansion sets (including two special campaign sets) until it was redesigned for a second edition. 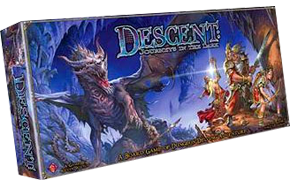 Featuring development of many of the mechanics from Doom—especially the special coloured dice—Descent is the gaming experience par excellence for those who want to go down into the dungeon and kill things and, with the expansion sets, run ‘roleplaying-light’ fantasy campaigns as well. There’s a vast selection of fantastic plastic miniatures to paint, hundreds of interlocking terrain tiles, cards by the thousand (or so it seems), and enough scenarios to keep even the most dedicated dungeoncrawling team busy killing things for years. Descent took Doom’s dice system and developed it further; adding a bit of complexity, and a huge range of options and variants in the form of decks of magic items, weapons, armour, spells—all the classic ingredients of your typical dungeon delving expedition. The game is semi-cooperative: one player is the Overlord, and controls the dungeon and the monsters and the various threats that the heroes must overcome, and the other players cooperate as heroes to defeat the Overlord’s schemes. I’ve completely revamped this rules summary and reference sheet to also include double-sided reference sheets for the overlord and hero players, a town equipment list to speed up buying starting equipment, and a complete list of all the heroes and their stats. Covers the base game and the three expansions, Well of Darkness, Altar of Despair and Tomb of Ice.